Parents Jo and Rick Nelson never imagined riding and showing animals such as horses would interest their daughter, Julie. 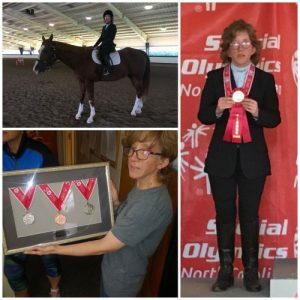 Since age 10, when given her first opportunity to ride and for the past 23 years, Julie has practiced and perfected her riding skills, learned the intricacies of communicating with horses and won numerous Special Olympics medals. Jo believed her daughter had found her niche. Julie, 33, a resident of Monarch’s Hoke Street group home in New Bern, continues to pursue her interest in horses and compete in Special Olympics. Julie has seemingly carried on a family tradition that dates back generations. Her great grandfather was a mounted Calvary office in the army while several other relatives on both sides of her family rode horseback. Jo recalled how Julie showed no fear when she was first introduced to her cousin’s horse by her aunt, and namesake, Julie. Jo noted that riding initially improved the way her daughter, who is diagnosed with autism spectrum disorder and severe hearing loss, communicated at 10 years old. Near and dear to Julie’s heart was her long-time horse, Sunny Delight, her first and one that she rode for 20 years. “He took very good care of me,” Julie said of her favorite horse who passed away two years ago. Currently, Julie rides a black-and-white pony named Maxi. “I enjoy riding horses and it makes me happy,” added Julie. Riding horses allowed Julie to form a bond not only with the animal she was riding but to also have confidence in her trainer Holly Hyatt, who has known the Nelson family for over 20 years. In 1997, Hyatt helped Julie prepare for her first North Carolina Special Olympics. Julie is currently practicing for Special Olympics competition next fall in Raleigh. In addition to riding, Julie enjoys working at her part-time job at the Center for Industrial and Physical Therapy in New Bern. Photo collage: Bottom left, Equestrian and Hoke Street group home resident Julie Nelson shows medals she earned while competing during Special Olympics for riding horses; top left, showing off skills while riding her horse, Jazz, during the 2018 Special Olympics; right, receiving her medal during Special Olympics.